Experience the fast Internet access with TRENDnet's 56Kbps (V.90) High Speed USB Fax Modem. Simply plug it into the USB port on the PC or notebook computer for easy and fast connectivity. 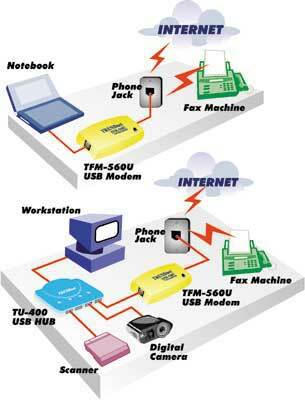 TRENDnet's USB Fax Modem can be connected to or disconnected from the computer without turning off the system. With the highest possible data communication rates at 56Kbps/V.90, reliable error-free transmission and widespread interoperability with other users can be accomplished. TRENDnet's TFM-560U provides fast and easy installation with free communication software. User Friendly: Easy installation and startup can be accomplished! Speed: The TFM-560U is capable of V.90 56,000bps download speed. Economical: Provides low-cost connectivity to the Internet. Affordable: TRENDnet's TFM-560U bundles with multi-language communication software in completing data and fax standards.